Sleep isn’t something we do a lot of in this household. I am a night owl who unfortunately is forced to live in a day time world, which means a lot of insomnia. My pre-teen daughter has seemingly inherited this gene from me, and if you’ve read any of my past posts you know Caden has never been a big fan of sleep either. Things have hit a new low though recently as one of the medications my daughter is taking for her chronic daily migraines is preventing her from sleeping and Caden is dealing with a concussion (fell a week or so on ice on the playground) and a virus that has him completely congested. So when someone mentioned a relatively cheap, drug-less, “easy” method for dealing with insomnia I jumped at the idea. The idea…..guided imagery. A little research later and this seemed do-able. I found a company that makes a whole line of relaxation CDs for children, teens, and adults. I had my daughter listen to a few clips and we pretty quickly realized that the ones with positive affirmations weren’t going to work because she said the idea of someone she didn’t know whispering at her in the dark was more “freaky” than relaxing. Some of the other products seemed promising though, and they were available on CD, mp3, or in the iTunes store. Product purchased instantly and I was signed up, on board, and ready for us all to sleep again. I tried it the first night and honestly it did help me calm down and I think I went to sleep faster. Unfortunately the screams of mommy coming from Caden’s room didn’t exactly allow me to stay asleep and him moving back into our bed a few nights ago certainly didn’t assure restful sleep. Although I am slightly biased, my son is absolutely adorable when he sleeps. [Cue adorable picture of sleeping child]. This stillness however only lasts long enough for you to snap a picture and then you’re back to protecting yourself from his head of steel and always active elbows and feet. Tonight we have had “blinkouts” (what Caden calls flickering lights) and lots of strange noises due to extremely high winds. Seemed like the perfectnight to try guided imagery with Caden. I should mention before I start this story though that Caden has turned into the Giggle Monster lately—everything, and I do mean everything, is giggle worthy. We laid down and I told Caden we were going to take a trip with our minds while listening to music; his response? Well that sounds boring. I told him to just pretend with me and then spent the next few minutes trying to define pretend to a very literal child. So I switched to let’s close our eyes and tell a story that matches the music. He agreed [with a lot of giggling]. I suggested that we were in a forest to which he responded “no we not mommy, we are in bed.” Which was then followed by “what’s a forest mommy?” I then spent the next few minutes trying to explain a forest before I gave up and said the woods, Caden, the woods. I tried again with oh did you hear that bird Caden, do you see it in your mind? To which he responded, “not bird mommy, the ipod.” [cue more giggling]. Caden let’s try to imagine what we might eat in the woods. Caden’s response, “a ‘nana” to which I tried to follow on by saying tell me about the banana you see Caden. Not missing a beat, he said “don’t see ‘nana Mommy, want one for snack now.” I then spent the next few minutes explaining that he couldn’t have a banana because he had already had dinner and a bedtime snack. [cue more giggling]. Hearing a bird in the music, I tried one last time to get him to tell me about the bird that might be flying around. He said an eagle which wasn’t a surprise given that his sister just took a field trip to the National Eagle Center and he now wants to visit. I had to ask….Caden’ what’s the eagle doing? His answer should have been predictable…..”it’s pooping on your head mommy” which is his latest response/reply/answer for everything. [cue lots more giggling]. At this point I turned bedtime back over to the daddy who was delightedthat the Giggle Monster was so wound up, giggling, and bouncing on the bed. Let’s face it, I get some great ideas sometimes [cue lots of sarcasm] but guided imagery with a literal child on the spectrum ranks right up there with trying to use the kitchen stool as a ladder to stand on to reach something in my cupboard. Thinking I might be brave enough to try again with my daughter, I mentioned it to her as a possibility for bedtime which was met with a “whatever” and dramatic eye roll. If you need me, I’ll be in the corner with my headphones on trying to enjoy my walk in the forest without flinching or ducking when I hear the bird sounds because darn it, the only image in my mind now when I hear the birds is of that dang bird pooping on my head. Tonight we have had “blinkouts” (what Caden calls flickering lights) and lots of strange noises due to extremely high winds. Seemed like the perfect night to try guided imagery with Caden. I should mention before I start this story though that Caden has turned into the Giggle Monster lately—everything, and I do mean everything, is giggle worthy. At this point I turned bedtime back over to the daddy who was delighted that the Giggle Monster was so wound up, giggling, and bouncing on the bed. It’s hard to believe that I posted this video almost 3.5 years ago as we were beginning our fundraising journey for Elf. For some reason I was drawn back to this video today, and as always I cried watching the video. I’m not quite sure why that video always evokes the strong emotions for me that it does; maybe the combination of hearing Caden’s daddy sing, reliving our autism story, or remembering how overwhelmed I was at the service dog fundraising task. Today though it also struck me how long 3.5 years really is and all that we have packed into that time. Of course there is the obvious. Watching the videos—my babies were so much younger. 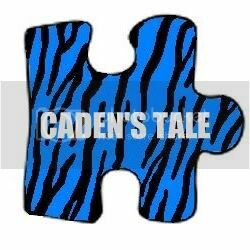 Caden was just a few months past his 2ndbirthday when he was diagnosed with autism. I went from not knowing anyone with autism to having my own autism awareness campaign. I used to worry that I wouldn’t remember the facts and statistics and now they are as familiar to me as my own name. Aside from autism, though my beautiful blue-eyed son has gone from a sweet toddler to a precious kindergartener and my lovely daughter has matured from an elementary school child to a pre-teenager. Autism is multi-faceted; some aspects have become more manageable, some aspects are the same, and as Caden develops so do new symptoms. Communication remains a huge challenge for Caden. At the time of his diagnosis he had lost all but two of his precious words, and we didn’t know if or when they would ever come back. Honestly we didn’t know if the words were still in there; it was really only after we moved from Kentucky and met Miss Jody, the most amazing speech therapist we’ve had in Caden’s “therapy career,” that we realized the words hadn’t left us, he simply was no longer able to share them. Today his vocabulary never ceases to amaze me; he picks up and retains words in a remarkable fashion. His challenge now though is articulation. Along the way he also learned that others should understand and respond appropriately when you talk and he’s so sensitive that he’s realized his words don’t always “work.” This awareness has created a new set of communication barriers that often have Caden grunting rather than risking others not understanding him. It’s almost as though the closer we come to communication, the further away we are. Another challenge for Caden when the video was made was with any type of interaction outside of me, his dad, or his beloved sister. Besides the disappearing language, the other redflag for us was when Caden was 2 he didn’t know anyone outside of their context. So he had a wonderful babysitter with whom he stayed several hours a day 5 days a week while Dan and I taught. He adored her but had no clue who she was outside of the home she babysat him in or at least he refused to interact with her in other settings. He also was terrified of anyone even being in the same aisle as us in the grocery store. He still gets overwhelmed if the store is really crowded or loud, but having Elf with him has given him the confidence to be curious about what’s around him. Although it makes grocery shopping a painstakingly long process, it is also amazing to see him ask questions about everything on the shelves and for the most part ignore the people he would have a few years screamed out or about. Interactional difficulties were probably my biggest fear when we sent him to Headstart full time. His school was next to his sister’s school and more often than I should admit I would go to school to pick her up early just so I could go next door and spy. Sometimes I’d watch Caden play on recess from my car window. He was always by himself; he was quite content but never ever with any other children. His classroom also had a one-way observation window that I could watch from and again he was always on task but never with any other children. I would leave Headstart with my heart in pieces and my eyes full of tears. Reading about autism and knowing what to expect doesn’t alleviate or prevent the pain that comes with actually seeing autism in action. I would leave myself enough time to cry, wipe the tears, put some powder and a smile on and then pick my daughter up from school. While she was telling me about her day, we’d run over to Caden’s school and pick him up as well. Although there are parts that are hard to recall about those days, I can say that his Headstart teacher, Miss Yolanda, was and is the reason that Caden loves school. I don’t know how she did it, but she left such a positive impression on him that he begs to go to school even on the weekends and during the summer. For that I will forever be grateful to her. Caden’s love of school traveled with us as we moved out of Kentucky. Although I was once again nervous and worried, he fell in love with the Montessori learning environment. He has honestly flourished academically and Miss J, his teacher for the last 3 years, has helped him maintain his love for all things school. Reading and writing remain a huge challenge and as such we made the gut-wrenching decision for him to repeat Kindergarten again this year. That decision hurt, but has proven to be exactly the right one for him. He’s now working with first grade for his math classes and in the last month has read several dozen words. He is also making shapes and telling us what letter they are out of anything he is playing with—today it was a slap bracelet, yesterday it was French toast. I wish I could describe how wonderful those letters and words sound coming out of his sweet mouth. Even more satisfying though is listening to him talk about his friends; I never tire of hearing Sawyer this and Sawyer that. See Sawyer is a real 6 year old little boy who excitedly waits for Caden to come to school—they talk, they work together, and they even plan play dates. This last year we had several parents askus for play dates because their child was “always” talking favorably about Caden and wanted more time to play with him. Although he doesn’t always understand how to play, the reality is he isn’t alone on the playground anymore and he isn’t sitting by himself in class. That reality brings a whole new set of tears to my eyes. That’s also the reality that gives me tremendous hope for Caden’s future. Of course there is the obvious. Watching the videos—my babies were so much younger. Caden was just a few months past his 2nd birthday when he was diagnosed with autism. I went from not knowing anyone with autism to having my own autism awareness campaign. I used to worry that I wouldn’t remember the facts and statistics and now they are as familiar to me as my own name. Aside from autism, though my beautiful blue-eyed son has gone from a sweet toddler to a precious kindergartener and my lovely daughter has matured from an elementary school child to a pre-teenager. Another challenge for Caden when the video was made was with any type of interaction outside of me, his dad, or his beloved sister. Besides the disappearing language, the other red flag for us was when Caden was 2 he didn’t know anyone outside of their context. So he had a wonderful babysitter with whom he stayed several hours a day 5 days a week while Dan and I taught. He adored her but had no clue who she was outside of the home she babysat him in or at least he refused to interact with her in other settings. He also was terrified of anyone even being in the same aisle as us in the grocery store. He still gets overwhelmed if the store is really crowded or loud, but having Elf with him has given him the confidence to be curious about what’s around him. Although it makes grocery shopping a painstakingly long process, it is also amazing to see him ask questions about everything on the shelves and for the most part ignore the people he would have a few years screamed out or about. Even more satisfying though is listening to him talk about his friends; I never tire of hearing Sawyer this and Sawyer that. See Sawyer is a real 6 year old little boy who excitedly waits for Caden to come to school—they talk, they work together, and they even plan play dates. This last year we had several parents ask us for play dates because their child was “always” talking favorably about Caden and wanted more time to play with him. Although he doesn’t always understand how to play, the reality is he isn’t alone on the playground anymore and he isn’t sitting by himself in class. That reality brings a whole new set of tears to my eyes. That’s also the reality that gives me tremendous hope for Caden’s future.